To be fair, I made this point before, when I was looking at The Dæmons. 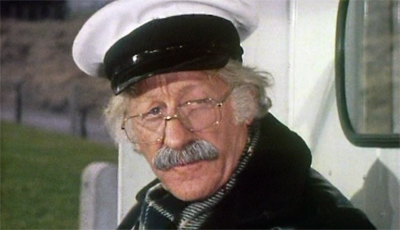 The Pertwee era, with its grounding in contemporary Britain, was undoubtedly a major influence on Davies’ revival of the show. This is most obvious in the decision to use the Pertwee-era villains the Autons (from Spearhead from Space and Terror of the Autons) as villains for Rose, the first episode of the revised show. Of course, there’s an obvious influence from other eras (especially the work of Hinchcliffe/Holmes and Andrew Cartmel), but the influence of the Pertwee era is fascinating because it runs deeper than you might expect. Of course, the structure of the revived television show was down to the realities of television production in 2005. The show was always going to reach a climax towards the end of a given season, because that’s how audiences expect narratives to work. 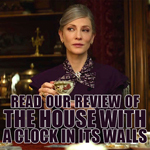 Davies couldn’t pull off a season-spanning cliffhanger like so many American genre shows, due to the necessity of keeping the Christmas Special accessible tea-time viewing. The shape of Davies’ Doctor Who was simply the shape that television took in the early part of the twenty-first century. And yet, despite that, there’s a very conscious debt owed to the Letts era. One could see Torchwood as a conceptual update of the whole UNIT era, albeit modified for prime-time viewing. Indeed, the Master’s whole plot in The Sound of Drums is basically his impersonation of John Pertwee, right down to the red-lining on the insider of his coat. There’s a strong sense of Letts’ approach to season finalés in the way that Davies works. The most obvious is the fact that then end-of-season episodes in the Letts era were undoubtedly big event stories – with Letts directing and also contributing the story as well as serving as producer. When people think of the Pertwee era, the The Green Death or The Dæmons come to mind as quickly as the other “big” stories of the era, like Carnival of Monsters or Terror of the Autons. 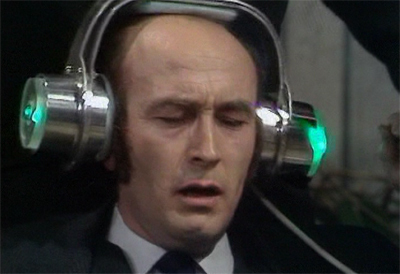 These are the purest bombastic most audience-pleasing examples of Letts’ Doctor Who. 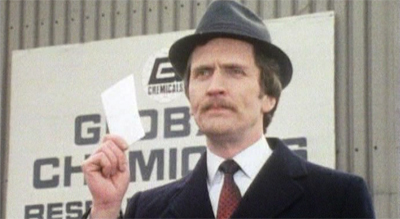 Although the Hinchcliffe and Holmes era had its share of iconic season finalés with The Talons of Weng-Chiang and The Seeds of Doom, it often felt like the manic brilliance of those scripts was powered as much by sheer desperation to reach the end of the season as it was by any careful or meticulous planning. However, the similarities run somewhat deeper. Those complaining about Davies’ use of gratuitous deus ex machina plot devices in stories like Doomsday or The Parting of the Ways will probably feel the same way about The Green Death. The Doctor just happens to pick up a blue crystal that can – in a decidedly new age way that isn’t too dissimilar from the “clap your hands if you believe” ending of The Last of the Time Lords – magically free Mike Yates from BOSS’s brainwashing. 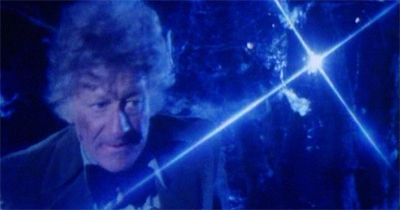 You could make a case that the seeding of the planet “Metebelis III” throughout Pertwee’s last two seasons serves as a direct ancestor to Davies’ “arc words” – the casual mentions of “Bad Wolf” or “Torchwood” or “Vote Saxon.” In both cases, a couple of words innocently dropped into a few lines here and there, never given too much importance, winds up becoming a big deal at the climax of the run. And yet both Letts and Davies are careful that the references never feel exclusive or in-jokey. Planet of the Spiders and Army of Ghosts make as much sense if you somehow missed the obvious shout-outs and references scattered through the show. Indeed, that’s probably the most interesting joint facet of Letts and Davies. Both creators see Doctor Who as a populist and accessible piece of entertainment, one that works better packed with iconic imagery than it does as a collection of fannish continuity. According to Letts, and arguably according to Davies, Doctor Who doesn’t have to make perfect rational sense, as long as it’s smart and enjoyable. This is about as far as it is possible to get from the continuity fetishism of the Colin Baker years. If some past element of continuity doesn’t make sense, don’t worry about it! That’s why Letts could get away with giving us several different fates for the city of Atlantis, while Davies never worried too much about how UNIT and Torchwood might coexist. This strange sense of simpatico between Davies and Letts is all the more fascinating because Davies struggles quite a bit with the tangled political subtext of the Pertwee era. This is arguably the biggest difference between Letts and Davies. Letts didn’t seem too bothered with framing Doctor Who as an overtly political show, save in some incidental way or the occasional attempt to engage with counter-culture. In contrast, Davies is quite fond of Doctor Who as political commentary, which makes it difficult when he tries to appropriate from the Letts era. The Letts era is interesting to read politically. On the one hand, the Doctor is officially part of the establishment. 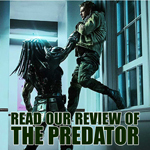 He pals around with soldiers, and it’s implied he’s a member of exclusive social clubs. Far from the cantankerous grandfather of the Hartnell era or the wacky uncle of the Troughton years, Pertwee’s Doctor is a patriarchal figure. He has settled and put down roots. There’s a reason that Jo is written out through marriage. The Green Death seems to imply that she has gone from being a girl to becoming a woman. We’ll return to the somewhat icky subtext that she’s marrying a younger version of her father, but it’s clear that the Third Doctor was more of an establishment figure than any of his predecessors (and, arguably, his successors). However, the show never seemed to think too much about the implications of this approach. So Letts steeped the show in new age mysticism and the trappings of counter-culture. The result is a strange mix indeed, and it’s simultaneously one of the most fascinating and perplexing aspects of the Pertwee era. 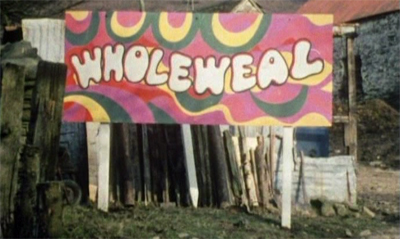 The Green Death really pushes this idea to the fore, as the show focuses on a hippy community inside a working-class area of Wales. It’s quite clever to set a show around the closing of the Welsh coal mines, a decade before closing coal mines in Britain would become a national issue. 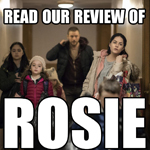 However, the show can’t seem to decide whether it prefers the working-class values to those of the hippy love-in, and the result is rather surreal. This is best exemplified by the suitably ridiculous (and strangely impressive) sight of the Brigadier having dinner with a bunch of a hippies. 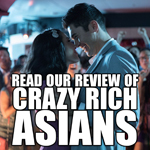 The show is aware of the absurdity of the set-up, and plays into it. The Brigadier, the most upper-crust of companions, arrives for dinner in a tuxedo and smokes an after-dinner cigar, while all the youngsters around him look a great deal more relaxed. 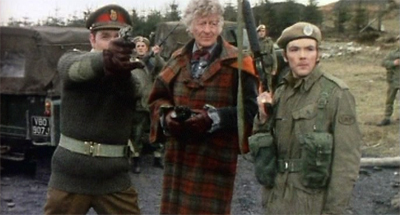 Nicholas Courtney doesn’t get too much do here (“give him ten rounds rapid”), but it’s a reminder of how brilliant Courtney and the character were. 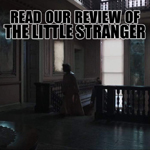 However, despite the charm of the scene, it does point to a conflict that’s hard to reconcile. The Green Death never seems to decide whether it supports the “Wholeweal” commune, or whether they’re just being a bit contrary about the whole thing. 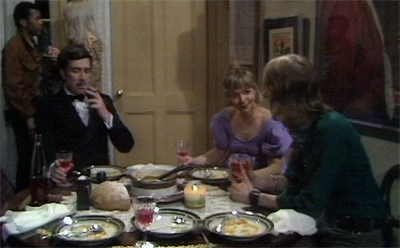 The premise of the episode would seem to suggest that The Green Death must pick one extreme or the other – either the local working-class town or the commune on the outskirts – but the episode manages to avoid alienating any potential viewers by drawing both groups as broadly as possible. The locals are portrayed as somewhat stupid and stereotypical. None of them are developed as characters, and they mostly serve as spectators while all those foreigners come down and sort out this whole maggot mess for them. In Boom Town, an episode of the revived show set in modern-day Cardiff, an alien jokes about how London wouldn’t care if the entirety of South Wales dropped into the ocean. While the Prime Minister does dispatch UNIT to the region here, there’s a sense that the locals should be grateful for the attention they’re receiving. The portrayal of the hippy commune is also somewhat muddled. 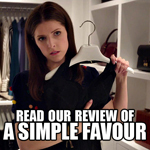 The show acknowledges that these people are paying attention to problems that the mainstream has yet to acknowledge. There is a definite worth in the work that they’re doing. 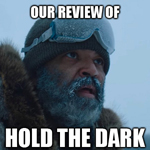 However, Professor Jones is portrayed is an adversarial crank. Despite the work that he’s doing, the locals’ attitudes towards him don’t seem unjustified. He’s bold and rude and disrespectful, and the implication is that he’s found himself at the fringe because of his own problems, rather than any broader societal issues. The Green Death sees the patriarchal instincts of the Pertwee era crash into the new age mysticism and counter-culture that the show would so regularly channel. Jones is an interesting character, because he embodies a lot of these conflicts and issues – which is oddly appropriate, seen as he’s repeatedly acknowledged as a stand-in for the Doctor. Jones is a radical, but he’s also a rather stern and patriarchal figure. Indeed, his treatment of Jo is rather patronising. “Still I suppose you can’t help being a bit cloth-headed,” he remarks at one point. “You’re only a kid, after all.” It’s weird to have a romance start on the suggestion that one partner sees the other as a child. Given the father-daughter subtext of the relationship between Jo and the Doctor, it can’t help but seem a little bit creepy. She hasn’t necessarily found a man with many of the qualities she admires in the Third Doctor so much as she’s found another father figure, but one she can marry. For a man living his own life outside the boundaries imposed on society, he’s quick to impose his own views on others. Jones is very quick to tell other people about how they are supposed to live. It’s easy for Jones to talk about being exploited when he has the wealth to set up and maintain a commune, and he doesn’t have to worry about providing for a family or paying his bills. Jones very clearly comes from a life of privilege, affording him the luxury to live the way he wants. “Progress?” he protests at the Global Chemicals talk. “Don’t listen to him. He means fatter profits for Global Chemicals. At the expense of your land!” One of the workers rather bluntly responds, “It’s all right for you. You can afford to live the way you want to. We need the jobs.” Another adds, “Aye, we can’t live on nuts, man.” Jones demands, “Can’t you see you’re being exploited?” It’s a rather condescending argument, and he never manages to rebut that criticism. It’s hard not feel a bit sorry for Jo. I’ll admit that I’m not a huge fan of Jo as a companion. That has nothing to do with Katy Manning’s wonderfully enthusiastic performance (and her genuinely heartwarming chemistry with Pertwee). Rather, I think Jo really solidified the idea of the companion as a young girl who was constantly in danger. She was the show’s first solo companion, and the way that Jo was portrayed arguably defined what the show expected from the lone female companion. 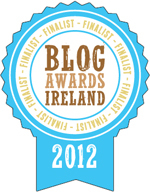 Quite frankly, Jo was the subject of a whole host of patriarchal nonsense. To be fair, the writers would often allow Jo to go off and do her own thing, rather than blindly doing as she’s told, but it would generally come with a harsh and patronising rebuke. Even here, the Brigadier rather grudgingly drops her off at the commune (because of course she’s entirely dependent on him for a lift! ), letting her know exactly how he feels about all this hippy stuff. “Not sure that I approve, Miss Grant,” he explains. “Duty is duty when all’s said and done.” She asserts her independence by replying, “Well a girl’s got to do what a girl’s got to do.” After a pause, she adds a duly deferential, “Sir.” Indeed, her opening conversation with the Doctor turns his capacity to tune her out into an affectionate in-joke. “You haven’t been listening, have you?” she demands. “Honestly, Doctor, you…” He finishes for her, “… never listen to a word I say!” The Doctor can recognise his own patronising behaviour, but he’s damned if he’s going to do anything to fix it. That would involve respecting Jo as her own person, after all. To be fair, The Green Death is structured so that it does give Jo her own character arc. It implies that, perhaps because of his unwillingness to see her as an adult, she is outgrowing him. 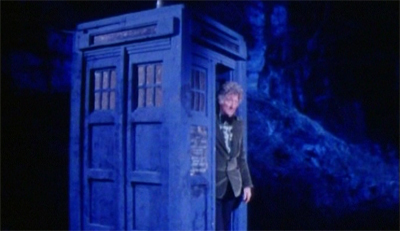 The opening episode’s recurring “the Doctor discovers that adventure isn’t any fun without Jo” gag is quite hilarious, and there’s a lovely little scene where Jo is left cold by the Doctor’s attempt to impress her with a knick-knack he picked up on Metebelis III. However, this decision is somewhat undermined by the fact that the show isn’t really sure what “growing up” means for Jo. What has she learned from her travels? How has she grown as a person? It seems that Jo is moving on and growing up by… essentially taking her existing job in a decidedly less impressive location and marrying a patronising stand-in for her father figure. It’s another suggestion that the show isn’t quite sure what to do with Jo. Rather pointedly, the show doesn’t suggest that Jo has progressed or evolved during her time with Doctor. If anything, her marriage to Professor Jones is a step backwards. Helping him out with his science, she points out that this is remarkably similar to what she was hired to do at UNIT HQ. “You know, when I first started working for UNIT, the Brigadier told me this was going to be my job,” she explains. “You know, holding test tubes for the Doctor and telling him how brilliant he was. Never seemed to get around to it though somehow.” Instead, she was out battling monsters and saving the world. “Holding test tubes” feels like a downgrade. 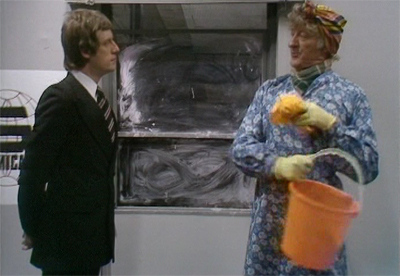 Still, The Green Death is an enjoyable six-part Pertwee and Letts adventure. 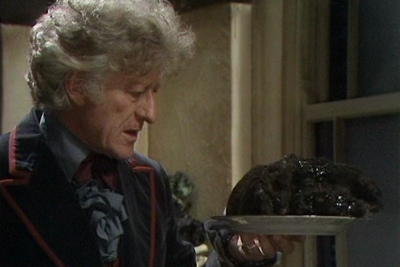 As with so many of the more enjoyable Pertwee stories, it doesn’t really do any one thing exceptionally. Instead, it concentrates on doing a lot of stuff very well. The maggots are an absolutely great monster for the show, joining the Autons and the Master as a wonderfully memorable and iconic adversary for the Third Doctor. How’d that get in the house? The special effects are particularly ridiculous, as we’ve come to expect from this era of the show’s history. 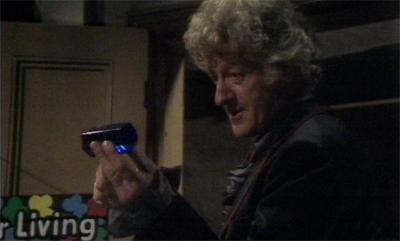 It doesn’t feel like a Pertwee story unless we’ve had some gratuitously dodgy CSO. The Green Death has a number of such sequences, ranging from the forgivable (using CSO to create giant maggots) to the absurd (Bessie driving along as Benton throws poison from it) to the inexcusable (really? they couldn’t build a cave set for the lift?). 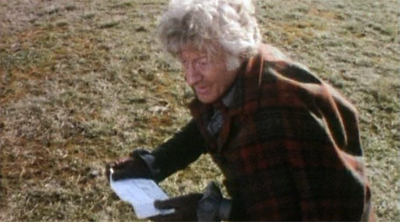 We also get a chance to watch Pertwee have a bit of fun, even if it does seem a bit patronising at the expense of the natives. Pertwee gets to wear some silly disguises and put on some funny accents while infiltrating Global Chemicals. (The highlight has to be his weird drag interaction with Mike Yates, complete with strange “bucket” gag.) 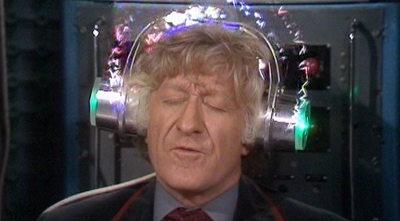 To be fair, Pertwee isn’t breaking a sweat here, but he’s taking it all in his stride and he’s clearly enjoying it. Which is nice, given how he’d phone in so much of his following year in the role. It’s a delightfully insane back story and motivation for an evil computer, and the episode seems to be in the joke. No sooner has BOSS explained the key to creativity and wit is inefficiency that it starts rattling on about how will enforce its prime directive of “efficiency, productivity and profit for Global Chemicals, of course. Nothing and nobody can be allowed to stand in the way of that. Not even you, Doctor. ” Of course, that’s a massive contradiction in terms, since BOSS apparently discovered inefficiency was the key to success. There’s every indication that BOSS isn’t just a dictatorial computer, it has gone completely bonkers. I actually really like The Green Death, despite its obvious flaws and problems – most of which are rooted in the confusing politics of the Pertwee era and the show’s attitude towards Jo Grant. Taken as a high-spirited adventure rounding off the show’s tenth season on the air, it’s actually a glorious celebration of the tropes and conventions of the Pertwee era. For better or for worse.